I’ve been experimenting with cookie recipes. Who am I kidding! I experiment with ALL recipes! It’s just lately its been with cookie recipes. I love fresh fruit, so winter would be very long for me without dried fruit. Peaches, above all else, are my favorite. I went to a big fruit and nut sale this fall and they had dried peaches, so I bought some. The problem was finding recipes that called for dried peaches…….not too many out there. I was undeterred. I started thinking of them like dried apricots and went from there. I made some peach butter (see my recipe) which was yummy. I have poached them as well, which is pretty tasty. 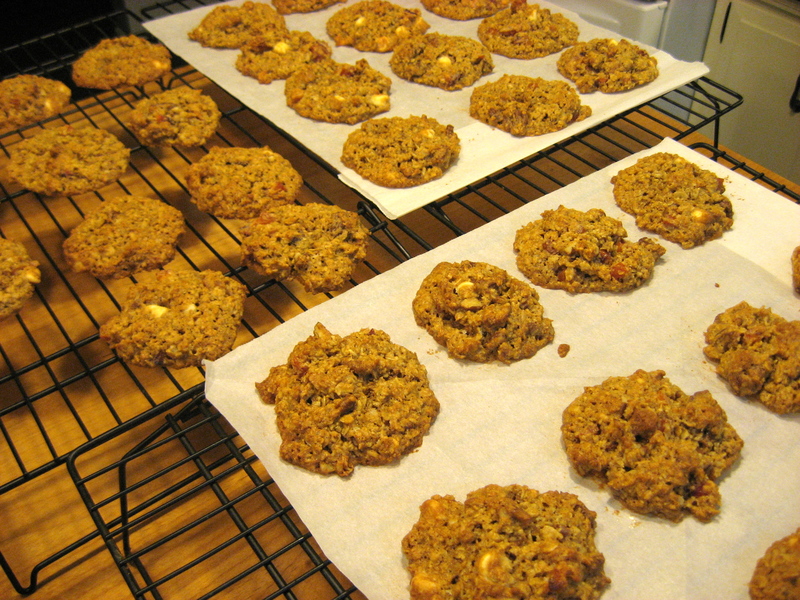 I found an oatmeal cookie recipe that called for apricots so I kind of did a take-off from there. I changed the sugar amount, the flour, the spices and added nuts and white chocolate. Very good indeed. If you read my stuff with any regularity (all three of you) you also know I’m into finding more ways to use shredded wheat. I’m here to tell you that anything you bake with flour you can easily substitute half the flour with shredded wheat and it will work just fine. SPREAD THE WORD PEOPLE! The cookie recipe I’m about to give you is a case in point. If you don’t have or use shredded wheat, you can easily put the flour back in the recipe. Makes 4 dozen cookies. They smell almost as good as they taste! In a medium bowl, combine flour(s), shredded wheat, baking powder and soda, salt, nutmeg, and cinnamon, set aside. In a stand mixer, cream butter, sugar and maple syrup until fluffy. Add molasses, eggs and vanilla and beat a few minutes more. Slowly add the dry ingredient mixture and beat at lowest speed until combined. Raise speed slightly (make sure mixer head is locked down) and add oats one cup at a time. Add peaches, then chips and pecans and mix until just combined. With a frosty glass of milk, life is good. 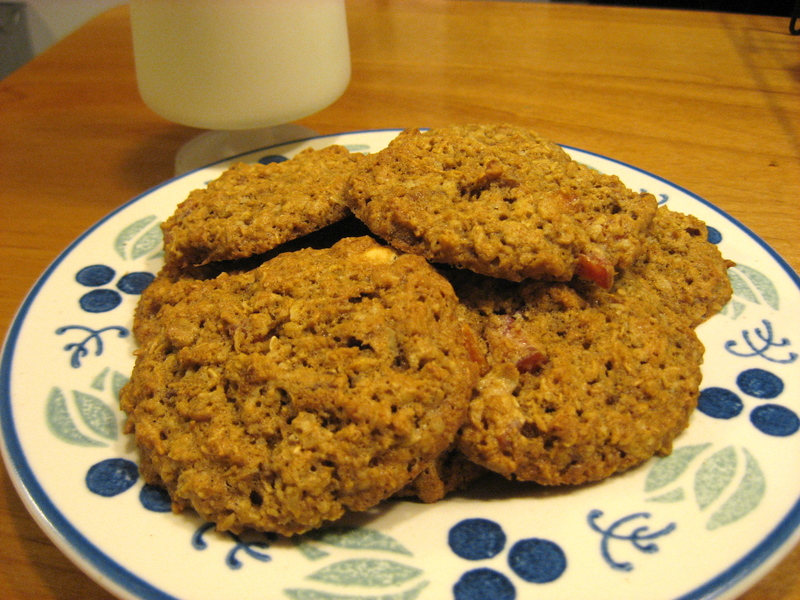 I adore ALL oatmeal cookies. These sound happy, but I’m totally intrigued by the use of shredded wheat. Shredded wheat? Like the cereal (unfrosted variety)? Yes, the cereal. You can use either frosted or unfrosted. I have the frosted kind (I’m still working on him to give it up the frosting, but he eats pretty healthy otherwise), so I also reduce the sugar in the recipes slightly to compensate.